Geir is not your average sales representative. He could be described as "colorful", even in an industry that has a lot of colorful characters. Geir is an avid swimmer, having won the U.S. National 800-meter Long Course Championship in his age group in 2004. 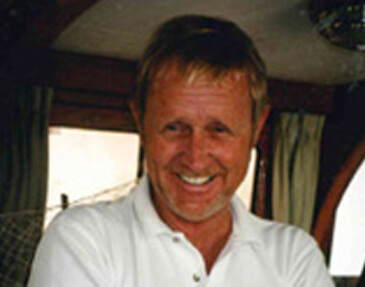 Geir is also an experienced yacht captain, holding an International Yacht Masters Certificate with Ocean Endorsement which allows him to captain any yacht up to 200 tons, anywhere. It was in this capacity that he began his yacht industry career, joining Hal Jones & Co. many years ago. After a time spent commissioning and delivering yachts, Geir got his license and started selling yachts. Back then, Hal Jones & Co was selling Offshore yachts, and Geir was immensely impressed with Offshore quality. Some of his fondest memories are of captaining the S.Y. MAYBE, an 85-foot wooden sailboat in the Mediterranean. This classic yacht is well-known in Europe going back to the 1930s. It was confiscated during the 2nd World War and used by the German field marshal, Erwin Rommel, also known as the "Desert Fox". Geir's travels have carried him to at least 57 countries. His varied career has included working on an oil supply ship off the west coast of Africa, Caribbean charter captain, production superintendent for Toyota in Durban, South Africa, and much more. Today, Geir lives in Ft. Lauderdale with his wife, Marva. These days, for relaxation, Geir enjoys riding his Honda VFR 800 sport bike, working out and competing in sporting events.